With ever fewer leaves on the trees and the colder winds having replaced the cool breezes of weeks just gone, the variety of birds to spot is dwindling with every day that passes. Fortunately, a few remain and a couple of hours meandering around the small inlets of Fornebu offered good views of several species. A Grey Heron hunting after food. The first bird to note was a Grey Heron that suddenly dropped from the sky in that awkward way that birds with with long legs often display. In the dark and nutrient rich mud flats it successfully hunted whilst the tide receded. It offered me great view, but for whatever reason, most likely user error I really struggled to get pin-sharp images. Next time! I observed many Common Eiders, amongst them some males in eclipse plumage together with Red-breasted Merganser and some Goldeneye. Like the male Common Eiders, several birds where in the process of moulting and shifting their plumage. 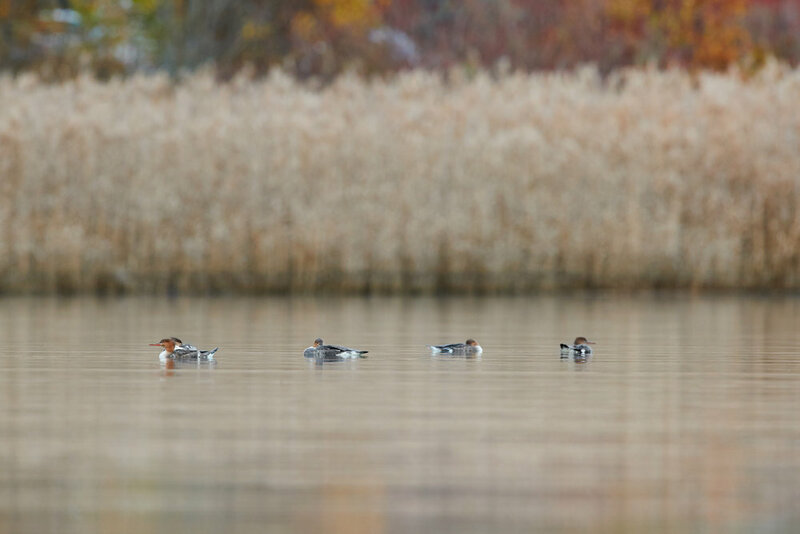 A small flock of Red-breasted Mergansers floated rather idly on by, seemingly oblivious to me. On my slow jaunt back to the car, I heard the call of a Fairy Wren from a small patch of reeds. After several minutes of looking for the Wren, I finally spotted it fleeting about the undergrowth. After some help from my phone and my bird app, the bird responded to the calls emanating from my phone and displayed reasonably well, if only briefly. Of the six shots I managed to fire, one was tack-sharp and somewhat pleasing. Until next time I get out birding! A Fairy Wren posed ever so briefly.